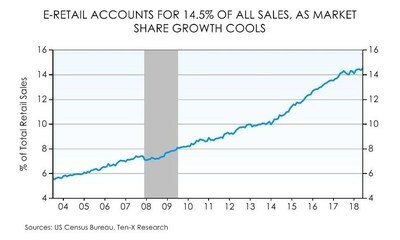 IRVINE, Calif. and SILICON VALLEY, Calif., Nov. 1, 2018 /PRNewswire/ -- Ten-X Commercial, the nation's leading online and only end-to-end transaction platform for commercial real estate, today released its latest U.S. Retail Market Outlook, which includes the top five 'Buy' and 'Sell' markets for retail real estate assets. The report, which contains data and analytics from Ten-X Research forecasts, Real Capital Analytics, Reis, RERC, U.S. Census Bureau and U.S. Bureau of Labor Statistics, shows a U.S. retail market grappling with the continued rise of e-commerce and hikes in rent cost. 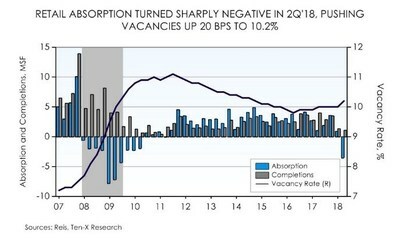 Retail net absorption turned negative in the second quarter of 2018 for the first time in seven years, indicating a dramatic increase in vacancies across the country. This drastic change, along with the increase of retail bankruptcies, is largely due to the massive rise in e-commerce sales, which have roughly doubled over the last decade and currently account for 14.5 percent of total retail sales. The result has been a supply overhang that is forcing landlords into searching for newer, more creative tenants to drive foot traffic. For instance, New York City's Brookfield Place is converting many vacant retail locations into hotels and offices. "Despite economic expansion in the U.S., the retail sector continues to wane with store closings and space shrinkage dominating the market," said Ten-X Chief Economist Peter Muoio. "Even major retailers that have not formally filed for bankruptcy yet, such as JCPenney, are downsizing their operations, focusing now on only their most profitable locations." Also adding to the deteriorating retail market is the fact that, with the vacancy overhang, effective rents are growing very slowly, expecting to finish 2018 up just 1.8 percent higher than last year, slower than inflation. Looking at factors such as vacancy improvement, rent growth and market NOI, areas including Salt Lake City, Indianapolis, Seattle, San Francisco and Austin are considered to be the best "buy" markets for investors. While the retail market as a whole is struggling, these few areas are noteworthy for investors and retailers. "Lack of demand is leading to high and rising retail vacancy rates and weak rents, despite the strong economy," said Muoio. "That said, we see continued gains in retail property pricing and healthy deal volume, as investors look to existing sagging properties as redevelopment plays. Indeed, e-retailers are increasing their bricks and mortar presence." "This investor interest is evident on the Ten-X platform," Muoio continued. "Between 2017 and 2018, Ten-X saw a 17 percent increase in the total number of vault visits per property, with total bidders per property also increasing by 24 percent. This surge demonstrates that investors are still interested in purchasing retail properties for new opportunities, even in a sector still working to find its footing." Salt Lake City's employment is up 3.7 percent from last year and its overall unemployment is trending 0.8 percent below the national average. Despite retail vacancies increasing on a national level, they are actually improving in Salt Lake City and driving continued rent growth. Furthermore, the city is attractive for investors because in the event of an economic downturn in 2019-20, retail rents would nevertheless be a whopping 8.2 percent higher in 2022 than their current mark, while vacancies would be lower, at 11.2 percent. Indianapolis is enjoying notable payroll gains in its key business, education and healthcare sectors, while its unemployment rate continues to decrease. 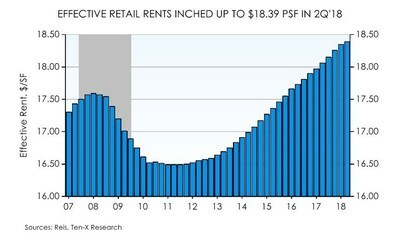 Retail rents grew to $13.62 per square foot, up three percent year-over-year. They are poised to continue climbing, leading to a solid 1.7 percent average annual NOI growth through 2022. Seattle's economy continues to thrive, with employment up 3.6 percent over the past year and continued salary growth. The city's retail vacancy rate measured 7.6 percent in the second quarter of 2018, slightly lower than Q2 of last year. Rents grew to $22.86 per square foot, tied with the prior quarter for the best pace of the cycle. Seattle would prove more resilient than average in an economic decline in 2019-20, with retail rents ending seven percent higher than their current mark and vacancies finishing lower than their current level. San Francisco's unemployment rate is 2.4 percent, well below the national average of 3.9 percent, with salaries steadily increasing. The city's retail vacancy rate increased slightly from last year to 3.2 percent and rents grew to $33.99 per square foot, keeping with their earlier cycle pace. NOI will see 1.7 percent average annual growth through 2022. Healthy demographics are aiding Austin's economy, with population up 2.7 percent in 2017, nearly four times the prevailing U.S. rate. Unemployment is well below the national average, at 3.1 percent. The retail vacancy rate in Austin measured slightly higher than last year at 6.1 percent and rents grew to $21.61 per square feet, somewhat slower than its recent pace. Austin retail looks to be resilient, weathering a potential downturn well, with vacancies in 2022 below their current level, making it an attractive option for investors. Despite rising payrolls, Memphis is suffering from an above-average unemployment rate of 4.7 percent. Current weakness in the city's retail market is set to persist in the event of an economic downturn, with vacancies finishing slightly higher than their current level at 13.3 percent by 2022 even after two years of economic recovery, and rents 1.2 percent lower from their current mark. Milwaukee's economy is constrained by weak demographics, with population growth that is well below the national average. The city's retail market appears stalled and is set to worsen, with NOI seeing 0.3 percent average annual declines through 2022. In the event of an economic downturn, Milwaukee would prove less resilient than average with rents decreasing by 1.6 percent and vacancies increasing by 10 bps. Low population growth is harming Central New Jersey, with the population rate up by only 0.3 percent from 2017 – the 14th straight year it trailed the broader U.S. average. The area's retail market is also struggling to gain traction. Central New Jersey's retail vacancy rate measured 11.5 percent in the second quarter of 2018, up slightly year over year. Rents grew to $20.92 per square foot, up less than one percent from last year and its slowest growth since 2012. NOI will see 0.2 percent average annual declines through 2022, with losses from 2018 to 2020 amid potential cyclical weakness. Weak population growth and an average unemployment rate are affecting St. Louis' overall market success. The city's retail vacancy rate measured 12.9 percent in the second quarter of 2018, slightly up from last year while rents grew to $12.96 per square foot, up 1.3 percent year-over-year. Rising availability will constrain NOI growth, with NOI seeing 0.3 annual declines through 2022. Despite employment in Northern New Jersey fairing slightly above its prior peak, the area's retail vacancies will keep climbing, harming rents and NOI. The area's retail vacancy rate measured 7.9 percent in the second quarter of 2018 and rents stand at $26.21 per square foot, up less than one percent from last year. In the event of an economic decline in 2019-20, Northern New Jersey's retail rents would decline and even after two years of national recovery would be 1.9 percent lower than their current mark, while vacancies would stand slightly higher than their current level, at 10.1 percent by 2022. NOI will see average annual 0.3 percent annual declines through 2022. Ten-X Commercial is the nation's leading online and only end-to-end transaction platform for commercial real estate. Since 2009, the company has sold more than $20 billion in commercial real estate. The company blends data-driven technology with industry expertise to accelerate close rates and streamline the entire transaction process. Ten-X Commercial and its parent company, Ten-X, are headquartered in Irvine and Silicon Valley, Calif., with offices in key markets nationwide. Investors in the company include Thomas H. Lee Partners, L.P., CapitalG (formerly Google Capital) and Stone Point Capital.